Who for – Suitable for most businesses, lower risk areas, low populations, part of the first aid team for higher risk and populations. Emergency First Aid at Work satisfies the requirements of the Health and Safety Executive (HSE). 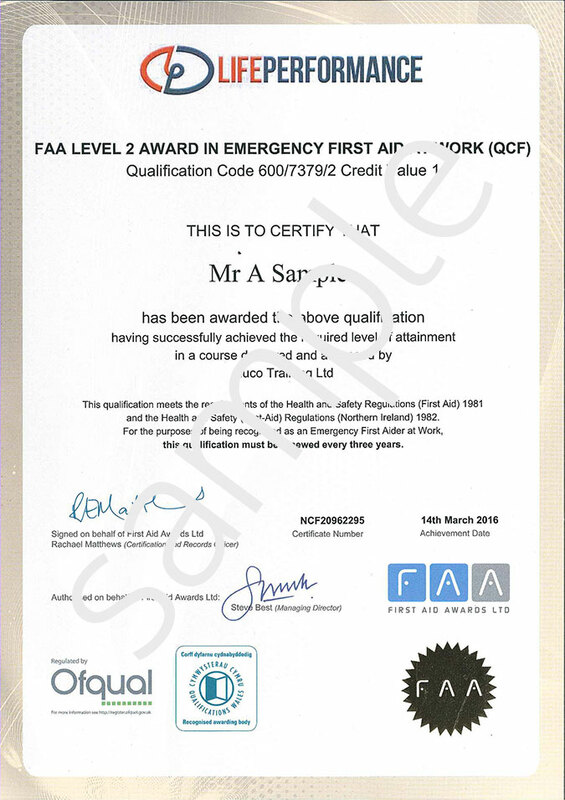 Awarding body – FAA level 2, Ofqual approved. Duration – 6 classroom hours. Maximum Number candidates – 12. Acts and regulations, first aid provision, responsibilities, scene assessment, hygiene, first aid kits, reporting, casualty priority, communication, primary and secondary assessment, unconscious casualty, airway management, recovery position, cpr, choking, epilepsy, shock, fainting, bleed control, amputations, burns, embedded objects, splinters. NB, The current industry standard, Ofqual approved, First Aid Awards level 2, Emergency First Aid at Work course does not include top to toe survey, defibrillator training, asthma, heart attack, fractures, spinal injuries, head injuries, anaphylaxis, eye injuries, child and baby emergency. However, we will cover these subjects on the one day course for your peace of mind. Summative practical assessment is ongoing by the instructor, along with a written assessment. A three year Level 2 Award (Level 5 in Scotland) in Emergency First Aid at Work will be issued to the learner, subject to successful assessment. Candidates receive - Certificate, wallet card and a comprehensive fully illustrated first aid training manual. Price – £65 per person / £320 for groups of 5+.